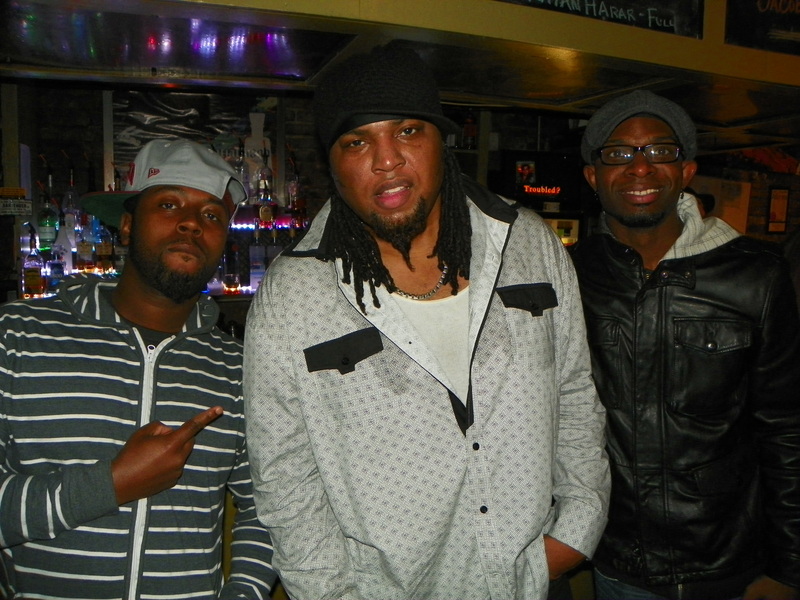 Jazz drummer Terreon Gulley celebrates with friends after his successful performance at the Apache Cafe in Atlanta, January 4, 2013. East St. Louis native Terreon Gulley is a highly-regarded young jazz drummer based in Atlanta who often plays with his fellow Eastsider trumpeter Russell Gunn. However, Gulley rarely plays in Atlanta, so it was a real treat to catch his all-star group of friends and associates at the Apache Cafe in Atlanta on Friday January 4. Gulley’s super-band played a style of jazz that is ostensibly straight-ahead, but clearly informed by hip-hop, gospel, soul and other contemporary styles. The best and brightest of Atlanta’s young jazz scene also came out to sit in. As for the Apache Cafe, there’s always something worthwhile going on there, so visit them at http://www.apachecafe.info/ to check their schedule, hours and menu. Let me add that the oreo cheesecake is to die for, as is the french-pressed Nicaraguan coffee infused right at your table.